This club had about 30 members who met each Saturday in Autumn and held competitions. 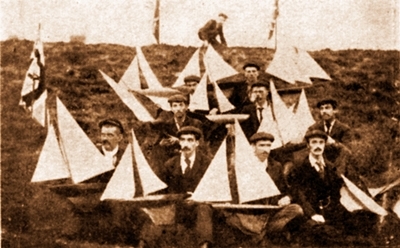 The members made their own yachts and the races took place across Fairhaven Lake. The boats had to cross the lake and reach the other side from two given points. After a lapse the club was revived and existed until at least the 1920s. Members of the first "Fairhaven Model Yacht Club" (1898-1901) pictured in 1899. FRONT ROW: L-R, J.Parr (killed whilst serving on a minesweeper in the 1914-18 War); H.Smith; W.Gill (Captain of the club, he later emigrated to Canada) J.Bellhouse (Club Secretary, Lowrey Terrace, South Shore, Blackpool). SECOND ROW: T.Smith (who later became a local coal merchant); E.Fish (Later worked for Blackpool Corporation); S.Smith (in business with his brother). BACK ROW: T.Eaves & G.Bamber (both of South Shore, Blackpool). A meeting of the members of the Fairhaven Model Yacht Club was held on Friday evening, in the Lakeside Cafe, for the purpose of providing challenge cups in place of the trophy won outright by Mr. T. L. Milne. Mr. S. Lonsdale (commodore) presided over a moderate attendance of members, the wet weather preventing many others front being present. Having explained the object of the meeting, viz., to provide challenge trophies for 10 and 15 raters, Mr. Lonsdale announced that Mr. T. L. Milne had offered to provide a silver rose bowl for 15 raters. Subscriptions amounting to over £5 were collected at the meeting for the other trophy. What form it will take will depend of course upon the amount of subscriptions. The list is still open, and Mr. H. Crowe, Estate offices, Fairhiaven, is secretary and treasurer.